Meet the owners of Bateleur Ltda. At this time my partner prefer to remain behind the scenes, working exceptionally hard to bring our vision to life. I will introduce him in due coarse. Until then, here is who I am, and a few of the things I have accomplished so far in life. My name is Jacobus Fourie. I was born in the Karoo town of Laingsburg. I grew up on a farm, and was exposed to firearms from an early age. By the age of 7, I had graduated from an air gun to the .22 LR, and hunted my first rabbit the same year. My interest and knowledge of firearms and hunting grow all through my teens, and when I finished school, I successfully completed a professional hunters course the very same year. With my knowledge and new found qualifications I was ready to enter the game industry. In 1996 I completed a game capture coarse to further my qualifications as a game farmer. In November of 1996 I bought my first game farm, Vingerkraal, in the Waterberg near Warmbaths. ( GPS coordinates: 24*43'18.35" S ; 28*00'08.38" E) . I have owned two other farms in the Bushveld, Groenfontein; (24*46'38.58" S ; 28*30'14.28"E) and Tweefontein (24*26'51.14" S ; 28*04'44.95" E). To further my business I successfully applied for Bona Fide hunter status in 2001. As my success as a game farmer grow, I was able to indulge in my passion – gun collecting. I was categorized as an official Collector by the South African police service in 2002. I am a member of the South African Arms and Ammunition collectors association, where I am registered as a category B collector (restricted and ordinary firearms) and as a cartridge collector. I am a member of the RSA Cartridge collectors association and specialize in collecting military cartridges. I am always expanding my knowledge and my reference library comprises no less than 700 books. 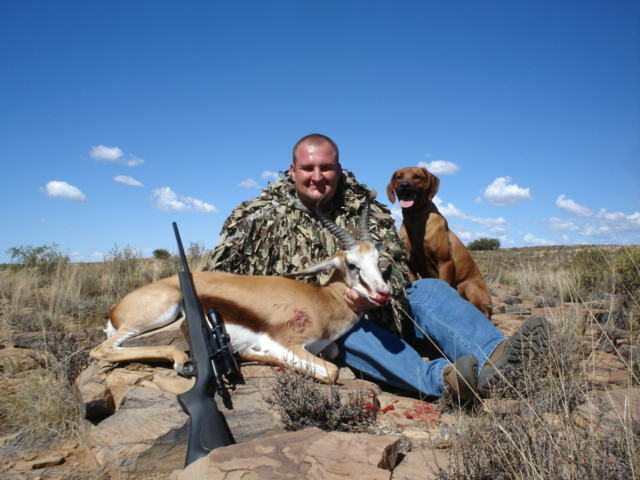 My love of hunting has not been neglected, and I am a member of the South African Hunters and Game Conservation Association, and have written articles for outdoor magazines. Wingshooting has always been a favorite of mine, and I am classified as a dedicated member of the South African wighshooters association. I also hold dedicated hunter status with the National Shooting Association of South Africa, and have competed in their postal shooting competition where I hold expert classification in .22 rifle, and marksman classification in both .22 and 9mm handgun class. I have been reloading for my almost 40 firearms since I was in my teens and used to be a member of the South African reloading association. I was the first person in South Africa to own a rifles in .416 Dakota and 6.14 Lazzeroni Spitfire calibers. I have designed my own wildcat cartridge, called the .375 Oryxx. I am also involved in black powder shooting, and am licensed by the South African police service to possess and transport black powder. In order to comply with changes in the South African firearm laws, I have completed the prescribed courses, and have been found competent in the use of all four categories of firearms, handguns, shotguns, rifles and hand machine carbines. In order to enjoy my sport, I am also a member of the South African Gun Owners Association to ensure my rights as a responsible law abiding gun owner is protected. With my years of experience with firearms and hunting, I am confident I am qualified to search the world to bring you, our most valued customers, the best, most affordable, reliable arms and accessories I can find. The owners of a Bateleur product can sleep sound at night with my personal promise of our unwavering dedication to standing behind our products. U have my personal guarantee!